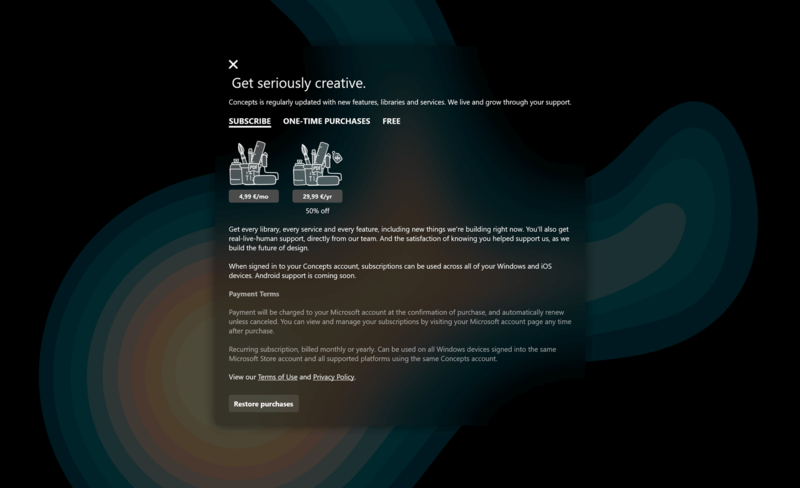 Concepts comes as a free, solid sketching app when you download it from the Microsoft Store. You can enjoy it this way for as long as you’d like. We feel like everyone deserves a solid sketching app whether they can buy one or not, so enjoy our basic tools, responsive feel, colors, customizable layout, infinite canvas and JPG export with this free package. Upgrade to the Essentials and become a Pro user. A one-time only purchase, it gives you the powerful ability to select, move and adjust your vectors. It also gives you high-resolution PNG export. Other features like brush editing, object libraries and further export types will be added to this package soon. In the Brush Market, we’ve crafted some beautiful brushes that add artistic elements to your drawings - brushes like pastels, chalk, paint and other dynamic pens and pencils. Purchase these brush packs straight from the Brush Market in the Brushes menu. Subscription gives you everything at once, going forward. This includes every feature, brush and export, including all of the many abilities that will be added as we develop Concepts for Windows over the next year and beyond. Subscribing opens up the ultimate in design capabilities both for you and for us — you get great tools, and we get to keep building them. Thanks for all the support. You make a world of difference to us - in fact, you are our entire world. We appreciate you.